In the spring the grizzly bears we view on lodges wilderness tours are primarily grazers. They some down to the shores of Knight Inlet to eat the sedge grass which is very high in protein this sustains them until the salmon enter the rivers of British Columbia’s coast in mid-August. The morning grizzly bear tour uses 18 to 20 foot boats to travel up Knight Inlet to the Glendale River where we transfer to smaller flat bottom boats that allow us to drift along the shore to watch and hear the bears eating. In the spring the grizzly bears we view on the lodges wilderness tours are primarily grazing or turning over rocks. 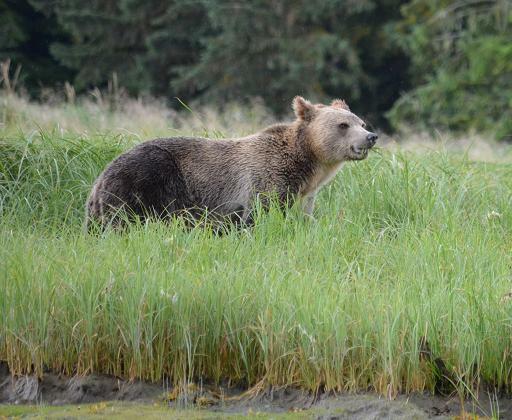 They come down to the shores of Knight Inlet to eat the sedge grass, which is very high in protein. This sedge sustains them until the salmon enter the rivers of British Columbia’s coast in mid-August. The morning grizzly bear tour uses 18 to 20 foot boats to travel up Knight Inlet to the Glendale River where we transfer to smaller a boat that allow us to drift along the shore to watch and hear the bears eating. 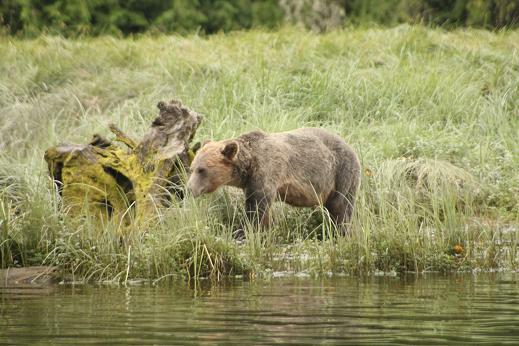 This flat bottom skiff also permits us to follow the grizzly bears up river as the tide rises.